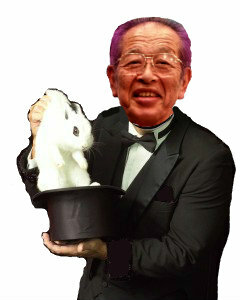 Thank You for the Magic, Sensei! On the 28th of January 2014 we will be entering the year of horse of wood. This will be my third year of the horse in the Bujinkan like it has been the case on 27th of January 1990 and on the 12th of February 2002. I see this third occurrence as some kind of Sanshin. Every year of the horse that happened always brought for me some major outbreak. Horse 1990. This is the year when I came to Japan for the first time and I experienced this as an epiphany. Everything I saw during my first stay in Japan inside and outside of the dojo was like magic: to train with Sensei in Japan; to meet with the Japanese Shihan; and to discover Japan and getting a taste of true Japanese culture. Horse 2002. With “Menkyo Kaiden” or 面 虛 怪 伝 as the yearly theme. Somehow the primitive magic of 1990 was gone but a new magic was arriving, a magic leaving the sole mechanical movements to enter something more mental, more spiritual. Techniques are easy but this evolution (revolution), this new paradigm was much more difficult and impossible to grasp. Menkyô Kaiden introduced us to a reality that existed behind reality; it introduced us to a 世界 sekai (world, society, universe) that existed only beyond the physical world. Please remember that 2002 was the last year of Budô Taijutsu and that Sensei was preparing us to grasp the pure magic of the realm of Juppô Sesshô opening in 2003. The year 2002 can be actually considered as Juppô Sesshô 101. Horse 2014. I don’t know exactly why but I have the feeling that this new horse, will bring us another one of Sensei’s conundrums. And this transmission will undoubtedly bring us deeper into his magic. Trying to understand Hatsumi sensei’s Sekai through our occidental preformatted minds is useless and will never lead you to get the 極意, gokui (essential point, essence) of what he is showing and explaining. The year of the horse in the Bujinkan reminds me of the story of the Kachi mushi, “the dragonfly holding the tail of the horse will travel further and faster”. This story has been repeated over and over by Sensei. This is a metaphorical story. The dragonfly never flies backwards and therefore was assimilated to victory by the Samurai. But in Sensei’s perspective, it is not only that but also that by training with him, we become this dragonfly and go further and faster at his running speed. We are the insects and Sensei/Bujinkan is the horse we are holding on to. We have been holding the Bujinkan tail for many years now and with the help of Sensei’s unstructured system we have come to understand several sekai (worlds) of magic. But if Sensei is the horse and we are the insects, the “tail” is our excuse to evolve. The tail is only a tool, don’t worship it. The Bujinkan is the tail, it is not the horse! His magic is revealed and demonstrated in each class. But how many bujinkan members are really able to see that what he is teaching us goes far beyond a mere collection of waza and fighting skills? Not so many I guess and this is a pity. But for those able to see, this is how we learned to see through the illusions of “reality”. The “real” world is not WYSIWYG, it is more like WYSIDNWYG (what you see is definitely not what you get)! In fact what Sensei teaches is true genjutsu 幻術 (magic). Sensei used to repeat during class that we were all “doctors”, now I understand that we are all becoming “magicians” if we train properly under him and see the world through kanjin kaname 観 神 要 “to see the truth through kyojitsu”, the magical reality is ours. Thank you Sensei for these magical gifts that you have displayed for us to take! I cannot wait for this new year of magical discoveries. Thank you for the magic!